As with most things, this is not a get-rich quick scheme. 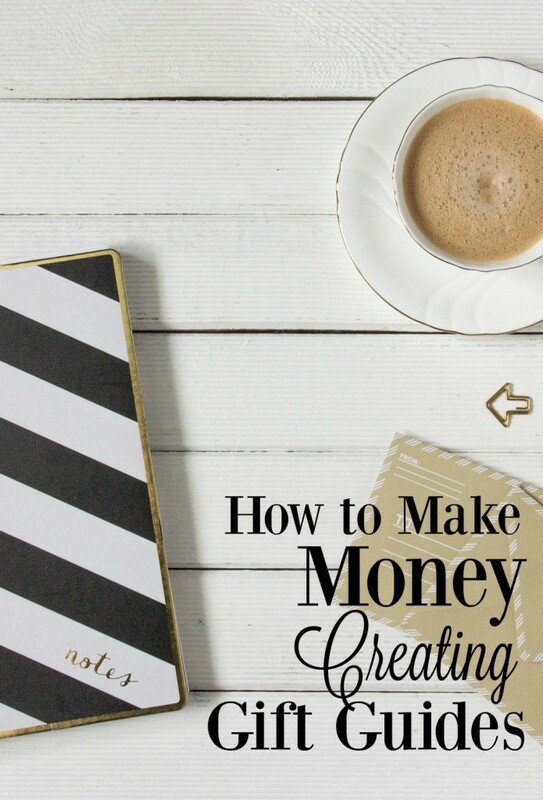 I didn’t start making noticeable money until years after publishing my first gift guide. These things take time to really penetrate social media, so you may not see money immediately. It takes a lot of time to put a gift guide together. If you’re already a blogger, be ready for this to take 5 times longer to create than a normal post (mostly creating links and images). Gift guides only succeed if they are really, really good. This means you need to really know what you’re talking about. You can’t just churn them out. There’s one critical element of making money from a gift guide – you have to become an affiliate partner with retailers. This means that every time someone buys something through your site, that company pays you a small portion of the sale (or sometimes they will offer a flat rate). There are thousands and thousands of companies that offer affiliate programs, but luckily there are easy ways to get to most of them. Before we get into the vast majority of affiliates, you should start with the biggest player – Amazon. They are the easiest place to start for a lot of reasons. First, everyone knows Amazon so they’re a very trusted retailer. They also make the process of getting links and images much easier than other affiliate partners. The other big reason is that they offer every product under the sun, so you have a lot to work with. The downside of Amazon is that they aren’t going to make you the most money. To make good money, you will need to branch out to other companies. Nowadays, that means signing up for Affiliate Partner sites that act as the middleman between you and the retailer. This makes your life so much easier and gives you access to a huge pool of retailers. Sometimes it can be hard to figure out which retailer is with which affiliate partner, but if you sign up with a couple of the big guys (they are all free), you will have access to just about every retailer you can think of. ShareASale – ShareASale is not my favorite, but they seem to make a lot of partnerships with small retailers which is kind of nice. They also make their link building process pretty easy, which is always nice. Some of their popular retailers include Shutterfly, Zulily, Tailwind, and Gymboree. Affiliate Window (Awin) – Awin is a great affiliate partner for one very great reason – Etsy! In addition to providing commissions for Etsy, they are partnered with Disney Movie, Fiverr, FabFitFun and a slew of other retailers. Commission Junction – Commission Junction takes a really long time for some of their retailers to get back to you, but some of their link-building capabilities are easier than other sites (you can actually get a link from them instead of using html). Some of their biggest retailers include: Groupon, Hootsuite, and GoDaddy. LinkShare – LinkShare is my least favorite affiliate partner, but sometimes you have no choice if you want a specific retailer! They are trustworthy, but I find their interface a little tough to work with and their turnaround time for retailer applications can be long. Some of their big retailers include: Nordstroms, Toms, and Crocs. 10 Great Gift Ideas for Women is going to go nowhere. It’s just way too broad. When you’re trying to come up with a topic for your gift guide, it needs to be really, really specific. I always try to find at least two niches to pair together. For example: Gift Ideas for 12-Year Old Girls, Gift Ideas for Moms that Love Reading, or Gift Ideas for Pet Parents. When you’re very specific, not only are you more likely to get social media traffic, but your gift ideas will actually be more relevant so you’re more likely to make sales. Once you’ve figured out a specific niche, you still need to take it a step further. You need to put items on your gift guide that most of those people haven’t actually seen. This is really, really important. If you’re targeting Dads that Love Star Wars, don’t list classic Star Wars gifts because odds are they already own that. To be successful you have to list ideas for people who already have everything. You need to really know what you’re talking about to do this, so it helps if you focus on gift guides that apply to you and your family. It also helps if you’re already a savvy shopper because you’ll know the right places to shop that always have unique gifts. Your image must be long. Don’t even bother with a horizontal image. It must be vertical and ideally a ratio of at least 1:2. Your image must contain text. On Pinterest, these statistically do better, so try to add text to your main image. Look through Pinterest to find pins that have text that you like and let that inspire you (but never copy something directly). I use PicMonkey to add text to all of my images and love it! Your image must be relevant. This goes without saying, but make sure your image is relevant to your gift guide. You need to catch someone’s eye before you’ll be able to pull them in! When you plan the layout of your page, try to make sure it flows smoothly and has a clean look. You don’t want it to look cluttered…BUT you should make sure to include a clickable image of each item. A lot of people will just want to scan through the guide before deciding if they want to read your description. You don’t need to have your own blog to create a gift guide (though that really, really helps)! 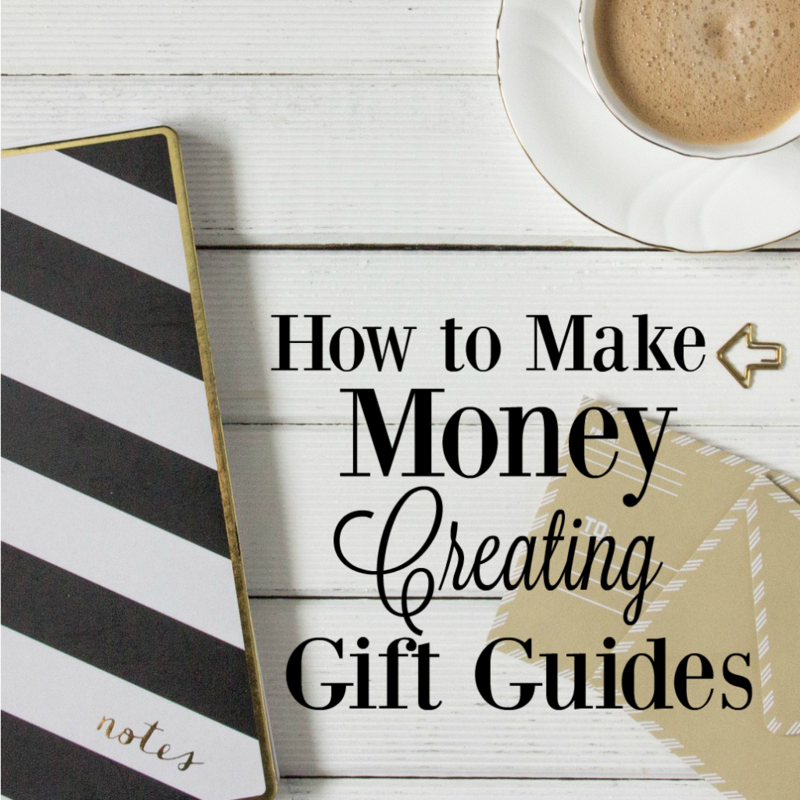 Like I said earlier, I started making gift guides years before I started my blog and I still am making money from those gift guides. There are micro-blogging sites that you can use to set up stand-alone web pages (I use Hubpages and am pretty happy with them). Using these sites is a great way to create unique content and find out if blogging is something you really want to pursue. Here’s the absolute best thing about creating gift guides – once they’re up, you only have to spend your time marketing them and checking in periodically to make sure links are working and products are updated. They’re a great addition to any portfolio! This page may contain affiliate links. This means that if you purchase through one of those links, I will receive a small commission at no extra cost to you. All opinions are my own and I will never recommend a product that I wouldn’t (or don’t) use myself. 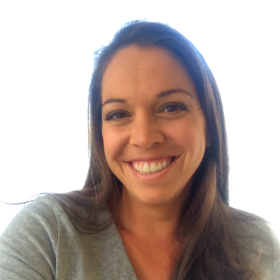 Links like these help keep the wheels spinning at MBA SAHM! Thank you for your support! Such a helpful post. I made my first Holiday Gift Guide and apparently made the rookie mistake of making it generic. lol Lesson learned! Now I know for the future to make it as specific as possible. I’ve been branching out into gift guides a little more, but need to expand my affiliates, as most of mine use Amazon.Great list of tips!